For a super busy multitasking person sometimes it is difficult to plan time in a hectic week or month to really invest in some personal development. As I have a full calendar and to do list that stretch on for miles it’s easy to slip into worker mode and forget about the rest. But the escape from the consistency of work is sometimes just what we need to get a new perspective on the same problems and a fresh approach to how we handle our jobs, family and our lives. A well planned luncheon or banquet often presents a rare opportunity to combine both networking and inspiration for a go-getter. 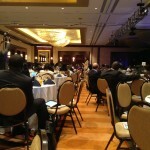 A banquet is set up from you to have the opportunity to engage at least nine other individuals. At the bare minimum you can quickly make an introduction and at its best a banquet seating can lead to a sincere personal relationship or powerful business opportunity. 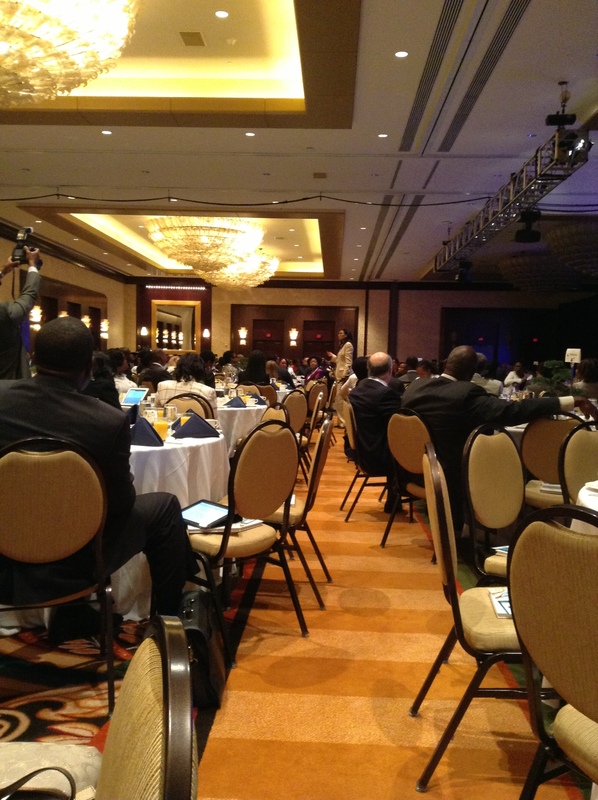 A perfect opportunity for inspiration for me came when the National Black MBA Association’s annual convention descended on Houston. In additional to having the ability to network with other professionals equally vested in expanding their network and knowledge, there are often exceptional speakers invited to provide some insight into their own experiences. I attended the luncheon with Guest Speaker, Judy Smith. Getting first-hand life lessons from someone you respect and admire can really put some of your own life challenges in perspective. 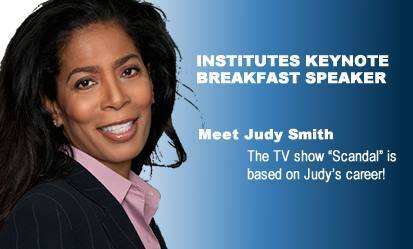 As a speaker Judy Smith did an exceptional job in demystifying the image surrounding the character in Scandal based on her life. Her message effectively highlighted an exceptional and unexpected career path and the drive for personal success she continue to modify to this day. It was a true reminder that opportunities are everywhere and are merely looking for the right person to identify the opportunity for what it is and be prepared to take the leap to grab for it. The final component of finding a great opportunity is really taking the time to let the inspiration lead to action. In the information age, inspirational stories and messages can be found almost anywhere and are read by almost everyone. The question really becomes how to take the lesson gained through the inspiration and apply it to your life and situation. My suggestion, do things to make the story active in your life. While at the NBMBAA luncheon I made sure to make note of a couple of the things that really impressed me during her speech. Nothing extensive, just a couple of notes regarding opportunities and being prepared when opportunity strikes. This does not have to be extensive, in fact the simpler the better. Keeping the message someplace where you can revisit (maybe even set a reminder with the message every month). Do whatever works for you as long as it something that will remind you of the message, not just in the moment, but on a constant basis. By boiling it down to the basics as this will allow you to make it applicable to situations in your life and really turn the inspiration into motivation to do or see something differently. I know that when choosing traveling in comfort or in style a lot of people choose comfort hands down. There is nothing really stylish about sitting in a small uncomfortable seat surrounded by strangers for hours. The comfort movement has taken people from wearing dresses and slacks when they travel to work out clothes. For me the transition is a little too drastic. Aside from my personal belief of wearing workout clothes only if you actually work out and usually when you are actually doing so, there can be a happy medium between being comfortable and being stylish when you travel. Having a little structure in your clothes don’t have to necessarily take away from the comfort and let’s be honest, there are all things about our body shape that we may not want to emphasis in super tight clothing. Plus you never know when opportunity will strike and being your best, comfortable self at the airport ensures you are always prepared and are ready to hit the road whenever you land. The key for me when traveling is to start with some basics and add layers. Planes are innately cold to me so I always need a jacket or something warm on the plane. Wearing the piece you choose to do so also relieves some packing space if you can wear it instead of carrying it (this goes for shoes too). An added bonus is it lets you regulate the temperature from your point departure and arrival city. For my most recent trip I choose to start pretty simple. By sticking with all black leggings and top I knew I would be comfortable and can quickly add small easy accessories to dress up the look. After heading out in my casual look I dressed it up a little by adding a nice sweater. 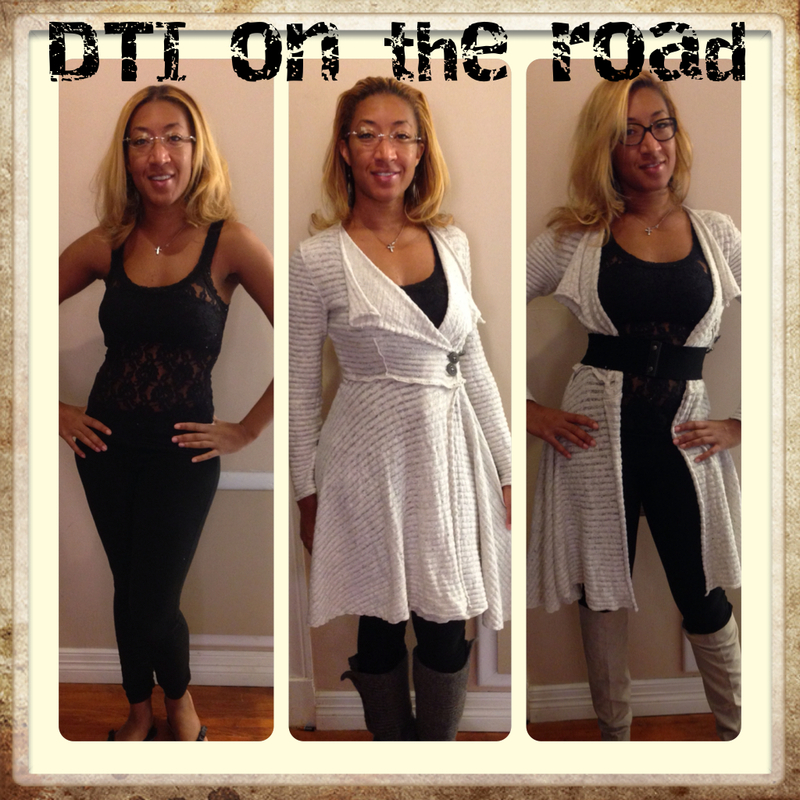 The design is reminiscent of a sweater dress and it lets me pull off a couple of different looks and keep warm. I decided to travel in UGGS mainly because of the plane temperature but they are also really comfortable. Not to mention they are a monster to try to fit in my suitcase. The germaphobe in me hates taking my shoes off and walking on my bare feet during security. 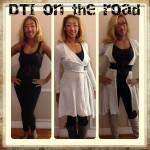 Adding the sweater alone dresses the look up externally while giving me the same underlying comfort I began with. Finally once I landed in DC I was ready to head to dinner. I dressed up my look by adding a belt and boots and was ready for a night out. It turns out I was a lot warmer in DC but fortunately by keeping it simple I could remove the jacket and still kept the look pretty trendy with all black and a cool pair of boots. All in all I think it was a good balance of comfort and style that quickly took me through three very different looks and environments.